CANBERRA, Australia — Two amateur divers who canceled their vacation plans to join what they thought was a hopeless mission to rescue 12 boys and their soccer coach from a flooded cave in Thailand received one of Australia's most prestigious awards on Friday. 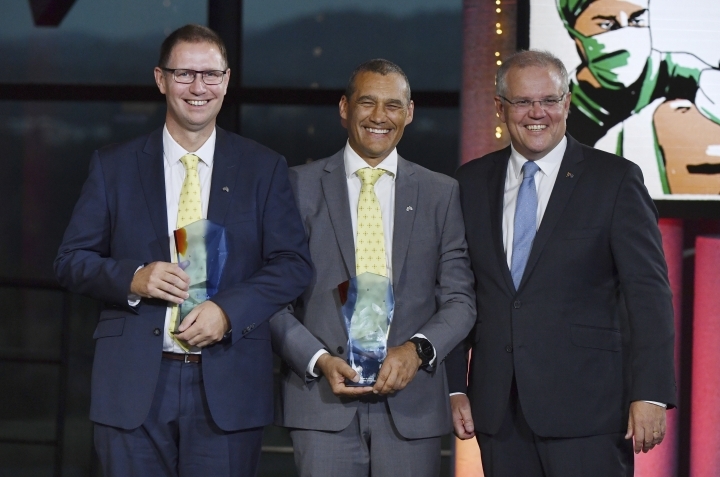 Prime Minister Scott Morrison presented Australian of the Year Award 2019 trophies to anesthetist Richard Harris and his dive buddy Craig Challen, a retired veterinarian, at a ceremony in the national capital Canberra on the eve of Australia's national day. "A lot's been said about this little adventure that we've had, but the bottom line for me is that there are 13 families that have still got their sons they wouldn't have if we hadn't been there as part of that group," Challen said. "That's what floats my boat." The complex rescue against the odds by an international team in July captured international attention. Both Australians have conceded they didn't expect that all 13 team members trapped in the cave for two week would emerge alive. "It was the best-worst plan that we had. I had no confidence at all that it was going to work and that the children could survive," Harris said. All 13 rescued Wild Boar soccer teams members congratulated the pair through a video message in which they said: "We love you. All the best." The thanks brought tears to both men. Harris said it was their first communication with the boys since the rescue. Challen said anyone with the necessary skills would have volunteered to help. The boys and their 25-year-old coach entered the cave on June 23 for a quick exploration, but flooding quickly blocked the exit and they had to retreat deeper inside the cave. Heavy rains raised water levels further and thwarted the initial searches before two British divers on July 2 found the group huddled on a dry patch of ground, safe but hungry. Harris and Challen arrived at the cave on July 6 and reached the team the next day. Harris sedated the 13 before they began their journey out over three days, fearing panic in the dark and confined cave system was a major threat to their survival. Challen helped remove the team's masks and wetsuits as the boys and coach were brought out on stretches through dry places. He then prepared them for their next dive through flooded sections of the cave. Their citations say that Harris's medical expertise was key in the plan to get the children out. After swimming through the narrow caverns to assess the health of those trapped and giving the medical all-clear for each evacuee, he remained behind until the last team member was safe. The citation also says Challen's technical expertise was critical to the operation. He played a leading role, working 10-12 hours each day in extremely dangerous conditions to swim the children one-by-one through the dark and narrow flooded passageways. Two weeks after the rescue, the pair was awarded the Star of Courage, the second-highest civilian bravery decoration in the Australian honors system after the Cross of Valor. Harris said he would use his title of Australian of the Year to encourage children to test their own limits in the outdoors. "I do fear for kids today who living in a risk-averse society will not learn to challenge themselves and to earn the grazed knees and stubbed toes that really are necessary to build resilience and confidence," Harris said. "You might think it's strange that having just rescued some kids from a cave, that I would like to promote kids to come under ground," he added. The two friends had been planning to take a cave diving vacation together when the Australian government invited them to Thailand. Harris was nominated for Australian of the Year by his home state of South Australia and Challen by his state of Western Australia. They were chosen from eight state and territory nominees. An Australian of the Year is chosen by a government-appointed board to celebrate the achievements and contributions to society of eminent citizens who are regarded as role models for their nation.